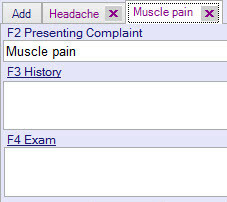 In the centre of your clinical notes screen, you can enter the details of each patient’s “complaint”. Once you have finished the consultation, the information you enter will be saved to your list of clinical notes. Note: The running time of your consultation is shown. The number of people in the waiting room is also displayed. These are both updated every minute. If there is more than one complaint, they are displayed as tabs. To add another complaint, click Add. Create as many as required, and move between them by clicking on the tabs. Remove complaints and the notes within them by clicking [X]. In the Presenting Complaint field, enter the patient’s complaint. This will become the title of the tab. In the History field, enter the full history of the current complaint. In the Exam field, enter the findings of your examination. Click on Assist to see a list of websites that can help you make a diagnosis or communicate with your patient. You may also choose to “Review Old Notes“. This will search previous notes for the same diagnosis. If you select a website, it will open in a new tab. Using the buttons at the top of the tab, you can choose to print or save the webpage. You can also create a PDF from the webpage (using the red symbol). When you are finished, click on “Cancel” or “Close” (at the top right). Type part of your diagnosis in the orange box and press [Enter] to search. For example, type “migra” to search for “Migraine”. Select the diagnosis from the list and click OK. The disease code will be entered automatically in the white box. 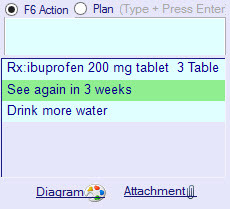 You may change the colour of this diagnosis using the drop-down menu on the right. This can make the particular entry stand out in your list of notes (at the bottom of the page). Organisation: only those in the same organisation can access it. Select To Sign where this note needs to be signed off by a doctor. Select either Action or Plan. Under Action, type any advice or procedures you wish to carry out immediately. Press [Enter] to save it in the list below. Under Plan, type any notes for the future. Press [Enter] to save it in the list below. Your actions during the consultation will automatically appear on this list (e.g. if you make a prescription or order a lab test). To delete an action or plan, click on the item and press [Delete]. Right-click on an item in the list to edit it, or convert it from an “action” to a “plan” (and vice versa). Diagrams and files will be saved to the patient’s clinical notes. You can use them as a reference when looking at the notes, and attach them to letters. If you wish to use a visual aid, click Diagram. Choose one from the list. Type the name of the diagram in the light blue box to filter the results. Click on the right-hand space to view a thumbnail image of the diagram. If the diagram comes up in Microsoft Paint, you can draw on the diagram and save those changes. You can also print or email a copy of this diagram. Click on the X in the top right-hand corner to exit the diagram window. You will be taken back to MyPractice, and prompted to give this diagram a name. If you wish to attach a file to these notes, click Attachment. Select the file from your computer, and enter a description as prompted. The attachment will be recorded in the patient’s notes. 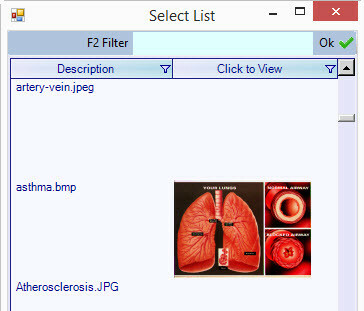 You can attach any type of Windows file to this patient’s record, including ultrasounds or adiology files you receive, ECG, Spirometry, Word or PDF documents. The original file will no longer be needed because when you attach a file it will be saved to the MyPractice database. When you are finished the appointment, click on Finish to save changes to the notes. Click on Finish+Bill to save changes and open the Point of Sale screen, where you can create an invoice. When you exit the clinical notes, the program will automatically print any letters, forms, scripts etc. that you have created. When you next open this patient’s notes, each “complaint” will appear in the Notes list.